Inspired by 2010's achievement of running through the year on only 24 pints, this year I'll drink more and run more. It's all over now, baby blue. And so it ends... Juneathon, for me, ended as it began, with a two and half mile run on the Galway prom. Perfect symmetry. Only difference being that I started this mullarkey being slow, unfit and very tired. One month later, I am a bit faster, a bit fitter, and have a lot more energy. I didn't run everyday like some of the legends doing this event, but I did something most days and blogged as much as I could. I enjoyed the community blog aspect of it all as well and have definite ideas about who should win, and who should nearly win! Well done to the organisers! I don't consider fishing to be a Juneathon event, but it was a nice event none the less. My nephew Conán came down to the rock with me - he'll be ten tomorrow and he is already a good angler! In fact, it was Conán who caught the only fish of the evening - a pollack of fair size. Robbie the dog came down with us - it's funny how dogs react to what must be strange events for them. Think of it - all the little fella could see was a group of humans with long sticks casting line into this huge mass of water and bringing strange little creatures in! Whether Robbie understood the concept of fish or fishing, he seemed to know straight away that whatever was at the end of the line was for eating! My brother Kevin joined me on a good five mile run in Seanféistín this evening. The place was full of sheep let wild on the hillside and the evening was perfect for running. Kevin, who only a few short months ago couldn't run much at all, was flying fit! The beauty of Seanféistín is that it has great scenery, good tough inclines and then it will gift you with a solid downhill run all the way home. We stopped at the brow of the second incline for a minute to take a photo or two, just to catch the moment... this is the first time that I've run with a camera in my pocket and was surprised that it didn't bother me at all. We ran at a decent, conversational pace, which was great all the way. Pictured: There he is, Kevin himself, with both thumbs pointing skyward in that famous Connemara picture pose. According to folklore, the first camera to ever reach the area was greeted with a thumbs down, which caused the camera man and his entire British entourage to storm off and send the Red Coats in to sort out the peasant upstarts who had caused such offence. Grain and livestock were confiscated until an apology was forthcoming. Therefore, ever since, through pure fear of losing grain and livestock, the average Connemara Joe sticks both thumbs straight up at the sight of a camera. (Of course this and many other versions of Irish history is pure hogwash!). One thing I have definitely developed during Juneathon is sit ups... did more today. The sincerity of my push up regime has been called into question by none other than Caballo Rojo himself, the Big R, Rónán...so I felt that from now on I should have a witness at all major up-pushing times! It is in this spirit that I have just asked my wife to watch as I dropped to the floor to do twenty. I can see the admiration in her face, though it is disguised as mild annoyance. Juneathon Nearly Done - Pints Update! Nearly there with Juneathon, did some sit ups and push ups today. I'm no Juneathon winner that's for sure, but I have enjoyed the process. I should also update my pints situation - which is one of the major points of this blog, after all, I am going through the year on only 24 pints! So far, I'm at 14 drank and 10 to go. April and May were hectic months on the pints front, because of the stressful situation in the Wee County. June has been good - I haven't had any, and my incling is that July will pass without as well. Back on the road. Rónán and I did six miles on Seanféistín this evening, no wind or rain to bother us. Rónán brought his garmin so for the first time I could accurately gauge my time and I was surprised to learn that I was running faster than I thought. The average pace was 8.33, but some of the stretches were comfortably in the 7 minute bracket. I haven't run with the Big R for a while so it was nice to get that stretch out. He is flying fit so it was nice of him to wait around for me! This wholistic clinic I visit has a machine called zen chi. You lie flat on the floor with your feet resting in cushioned straps and switch it on. It rocks and sways your legs and entire body for five minutes and then stops. Next comes a strangely invigorating experience of pins and needles all over your body. This lasts for a number of minutes. The exercise was meant to give me a boost of energy because I told the woman that I was feeling a bit low for the past few days. It works, I was pepping again within minutes. By the time I got home the students were arriving so I couldn't go out for a run but I will for sure tomorrow. I did have time to head up to Rónán's to learn some of the Chi Running stance. This and the Zen Chi made today a good Juneathon Technique day. A good chi day too. On Juneathon Day 22 I was feeling a wee bit tired so decided to go for simple sit ups again. Hope to be back running tomorrow. What in the world do push ups and fishing have in common, I hear you ask? The answer is simple: they were both part of my day today. So there you have it. Mackerel and Muscles. Hurling, one of the oldest field sports known to man, is surely one of Ireland's greatest 'inventions' and definitely among the best sports on earth. Then why the hell is it not played outside the country (excluding ex-pats of course)?! The great Irish mythological hero, Setanta, once defeated the hound of Culainn with only his hurley stick and sliotar (small leather ball), and ever since the legends of Irish hurling have a special place in the heart of the nation: the likes of Christy Ring, Henry Shefflin, DJ Carey and Joe Cooney, will never be forgotten...and never known outside Ireland! With the spirt of these great men firmly in my soul I took to a Juneathon day of hurling today - pucking about (not a rude term, it means hitting the sliotar with the hurley stick) with some lads who are staying in our house for a few weeks. A mild effort for Juneathon you might say - not so if you knew the game of hurling, or the sporting lads who took to the field! I hope the village was watching the world cup and not me. 3 miles this evening - the village route. I felt very heavy legged after last Thursday's run with Conor, when I pushed up the hills of Seanféistín at relative pace. As a result, I was embarrassingly slow this evening. I'd say the residents of Pointe and Caorán Beag were bent over with the mocking laughter as they looked out at me struggling up the road. What's worse, I met Conor on the way who told me that he ran a marathon this morning, when the day was really warm, and clocked 3.38. If this weather keeps up we are definitely heading for the best Irish summer since the 80s. However, we did have lovely spells in June last year and the year before only for July and August to bring on a deluge. Juneathon Day 18 and I did 20 push ups. I'm never going to be the incredible hulk, am I? Better to start uphill or downhill? Another five miler in Seanféistín with Conor. Our usual route starts at the cross road in Ros a Mhíl, heading towards the mountains. A long and slow incline, followed by a straight bit, then a sharper incline, down hill a bit and then turn around. I decided to run the inclines at pace again tonight, and sure enough I was absolutely knackered after finishing the last one. I used to hate starting my run with an incline but I'm beginning to think that it isn't the worst way to start off - it gets the body pumping straight away???? Chickening out of a barefoot run. Firstly I will come clean about not running this evening. I simply went for a walk instead - which, to my credit, is not a criminal offence. However, I set out with loftier intentions... I drove up to our local football pitch, where I had intended to tick my Juneathon box with some barefoot running! Since reading Born to Run, and learning a bit about chi-running, I have been determined to give a bit of barefoot on lush grass a go - just to see how it would affect my stance and stride. So I drove on up, without proper running shows, only to find that there was a football training session in train. I somehow felt that I would look a little mental running around barefoot, so I chickened out. Gone too far to turn back, and being without proper running shoes, I just got out of my car and walked purposefully for forty minutes. Someday, I'll pluck up the courage to go barefoot in broad daylight, but not today. I made the classic rookie mistake of thinking I was fitter than I am, and also thinking that I could run faster in this heat than I can on a normal Irish day. I blame Juneathon - which can fill you with false hope and dash it in the one day. My five mile route was the usual village run - wherein I run down to the pier first and then turn up towards the metropolis of An Cheathrú Rua, then as far as Tí Josie and down again - a measured fiver. I decided to take the hills with some pace (when I say hills, of course I mean slight inclines). By the time I had finished with Ard na Bleaistéirí (a notorious incline) I was pooped. Gone out too fast! Still, I trotted the rest at a decent pace and was only delighted to see home. Pace: Way too fast in this heat. Had very little time today so I just managed a few sit ups, before running out the door to a talk by a Wholistic medicine man. We are eating garbage according to this man... everything in the western world is processed - which means that it is zapped of all it's nutrients and by degree makes your body work harder to get less! Tomorrow I'll run, that's a promise. Fifty Sit Ups, Twenty Push Ups and Mostly Feet Up. Listen, I know I didn't do much today - some sit ups and push ups, but mainly I sat on my rear watching football of the Gaelic and World Cup variety. I am embarrassed when I look to the other great Juneathon bloggers who are putting up serious mileage every day, but on the plus side I wouldn't have even done those sit ups had it not been for Juneathon! I paused on Wolfe Tone Bridge and looked over to see what the others were watching. It was a mullet of Salmon (I'm reliably told that is what a group of salmon are called). They swayed from side to side, moving slowly en masse across the entire width of the bridge - as if they were consious of a show they were putting on. It was bizarre and very beautiful. The journey home from work takes me fifty minutes, so I had just landed in time to get out for a four miler before the England v USA game. I started slowly but ran the last two miles at a fairly good pace. The route was just up to the village and back down again. And then the game... the World Cup is poorer when your own country isn't participating but it still is a great competition. England would need to improve a good bit on this performance - the Yanks were gifted a poxy goal though! Route: Up the road and down again. Pace: Half slow half fast. When to eat before a run...??? I wonder what the minimum time is to eat a little something before running? Even the easy and slow three miler that I ran today, just out from my house and up towards the village, was made all the more difficult by eating a bit 45 minutes earlier. It wasn't that I ate all that much - just some chicken and veg, but it weighed me down a good bit. Back to the land of the E-Living. Internet back at home so I can blog on time from now on! Having said that, I have nothing much to blog - other than a pathetic effort at push ups to go with my fifty sit ups! Hoping to do a nice trot tomorrow though! What the hell is going on with that wind direction? If you run one direction against the wind, at least you'll have it at your back on the way home - right? Wrong. Wrong in Seanféistín anyway - where Conor and I ran six good miles and true yesterday evening. A beautiful place for a run it may be but by God it is the strangest place on earth where wind direction is concerned. It wasn't that the wind had died down either - had we turned to face our outbound trek on the way back it would still have been swirling but the minute we faced home it was neither to be felt nor heard! I only have stomach churning sit ups to report, I'm afraid. Fifty in all. No scenery, no birdsong, no hills, no lakes or turloughs. Just stomach churning sit ups. I hope to get out into the fresh air today for a five miler in Seanféistín after work - if my computer is back working I'll blog it today, if not, tomorrow. I can't run with earphones. Did an easy two miler today, back home in Galway. I did a four mile run in Stabannon this morning... thank God I got out early because the day turned nasty after 11! I'm up here for the weekend and just borrowing a computer for a minute to log this for Juneathon so OVER AND OUT! Knowing that I am A) working today and B) travelling four hours to Carlingford after work, I decided to get up a wee bit earlier and do what I rarely do - go for a brisk walk! Juneathon can make a person do the strangest things... I walked down as far as the pierhead, back up towards the village and home again - all and all about forty minutes in glorious morning sunshine - I should do this every morning! My next run, which I hope will be longish, will be tomorrow in Louth. I may take a full day off running today and make do with some stomach churning sit ups that I sat up earlier this morning. Fifty in all, which was a new departure for me so my stomach was burning after twenty. I wonder does this count for Juneathon???! Out the door, into the car, pick up Conor and ten minutes later we are running through the most spectacular scenery in Ireland. Seanféistín is easy on the legs and the eyes, with the soft bog road underneath and the rolling hills and lakes all around. As a young fella I used to travel out this road to watch my father cut turf, and then turn it, foot it and put it out on the road for drying - and then bring it home for the winter fires. Every once and a while I'd even take a break from throwing muck at the sister to lend the aul fella and the brothers a hand. Not often, but sometimes! 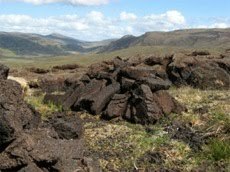 Last year I went out to that bog for the first time in 20 years to foot turf with my father. I felt bad for him at the start because he was lagging behind as I went roaring up the rows of turf -bending and turning, bending and turning. My father was taking his time, stopping to chat - falling yards behind me. By the end of the day though it was a clear case of the tortoise and the hare because my back was in agony and I had slowed to a near halt while he kept the same pace and overtook me easily! This evening I ran five and a half miles, slow and easy. I can feel the legs a bit tired after the last three days of running but hopefully this will regulate itself. I didn't bother trying the chi-method tonight - I was probably doing it wrong anyway and until I find out otherwise I'll enjoy the old slog jog. Some rain is promised, but tonight was a beautiful night for running, with a fresh breeze. Ireland's greatest golfer, Pádraig Harrington, spends the winter practicing the most basic of golfing requirements - his swing. Take one tip from me - never bet on Pádraig to win anything during the winter. And just like Pádraig, I'm struggling big time now that I'm trying to change my running technique. I only did 2miles or slightly more today, in very hot weather, but I was struggling with this new 'chi-running' (or at least what I think is chi). For starters, I found it tough to go slow, as the technique calls for the legs to be kicked back a bit and this creates a kind of motor effect. I was yelling at women with babies to 'GET OUT OF THE WAY I CAN'T STOPPPPPPPP'. Well, maybe not, but I was going faster than I would like. However, I stopped briefly before beginning the second leg of my route and re-shaped myself and it seemed a bit better for me, a bit bouncier and slightly slower. I may really be doing this all wrong but from what I can see on youtube I'm not far off and next week Rónán can put me straight, after his chi-date with Caitríona. Route: Out from the house, down to Pointe, back up to Tí Mhatt Tom and back home. Time: I don't have a watch. And so it begins... and for me, it began with a short run on the prom. A month of daily exercise and blogging ahead! It obviously can't be full on training every day, so what I've decided to do is to use the days between serious training runs to concentrate on my running technique. The great Cathríona McKiernan - she of world cross country championships and Olympic marathon fame, is coming to my hometown next week to give a few lucky lads a workshop on 'chi running'. Alas, I won't be one of those lucky lads, due to the fact that it will be the last weekend that I can visit Louth before the end of the summer. However, this 'chi running' has stirred my interest in running technique. The whole premise seems to be that you should aim to correct your posture and kick your heels back, whilst landing correctly at your hip line, rather than landing in front of you. The boast is that chi running can have you injury free for good - and it does make sense when properly explained. I will have to consult with Rónán, who will be at the workshop, to see if I am doing it correctly, but if I am it is tough on the calves to get used of it. You are definitely using a different set of muscles and that takes a bit of strain and getting used to. While on the prom, another runner passed me out and he seemed to have been chi-ing his way perfectly. He had a straight back, a slightly forward lean and was kicking his heels and landing perfectly. I decided to tag on and try to copy him. Luckily, he was coming to the end of the run so I caught up with him while stretching and asked him if he was 'chi-running'. He did explain though that he had put a good bit of work into technique and had bought some orthodontic insoles which seemed to help him kick back. Sorelimbs - A Runners Blog. Saturday, 2nd Feb, Stabannon with Benny: 3 Pints. 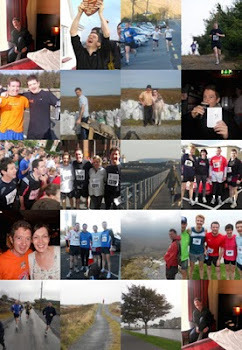 This blog started in 2010 when I challenged myself to develop a real running habit and only drink 24 pints of Guinness! Now with one habit developed I can relax back into the other! July 23rd: Cuigéal 8k: OUTRIGHT VICTORY! No time kept. August 20th: Tombrack 3Mile run, 31.54mins. September, 25th: Grey Lake Loughrea 10k, 52.44, Run a Month Club. October 8th: TríSpórt, 10k Chonamara, 53.12... Run a Month Club. December 10th, Waterford Half Marthon, 1.48.18... Run a Month, PB. October 10th, Rosmuc 6 miles: No time kept! December 30th: Ras an Pheg (Peg Race) WINNER! TIME UNKNOWN AND UNCARED ABOUT!